Allswell Mattress Review - Is the Luxe Hybrid the Firm Mattress for You? 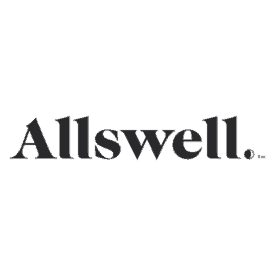 Allswell was recently announced as one of the new online-only bedding brands that are taking over the mattress industry. 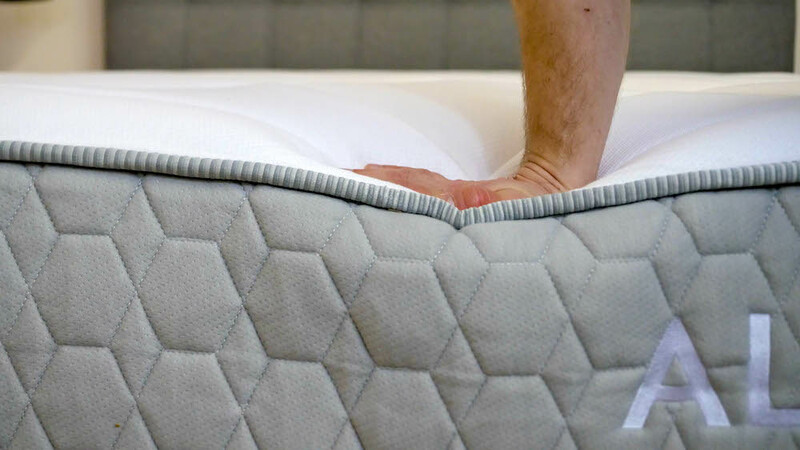 With a design-conscious aesthetic, the offshoot is all about helping customers find their “Instagram-worthy dream bed.” And now that the digital line is officially up and running, it’s time for me to take a look at its flagship mattress the Allswell Luxe Hybrid. Could one of these mattresses be the perfect match for you? Join me as I put each of them through a series of rigorous tests to figure out just that. Continue reading below for my full review of the Allswell Luxe Hybrid. Don’t have time to read it all? Click here to skip to the bottom and check out my review summary. Sleepers who want some serious bounce from their mattress will love the buoyant support of the Allswell Mattress! When discussing a mattress I always like to start out with a quick look at the materials used in the layers of the bed. So let’s jump in and see what the Allswell Luxe Hybrid is made of! As I mentioned up top, the Luxe Hybrid is built with with a hybrid design, meant to create an all-encompassing sleeping experience that’s as pressure-relieving as it is supportive. To do this, it’s outfitted with both soft foam and a pocketed coil system. Cover – The cover here is the same one used in the Luxe Classic, and is quilted with 3” of both memory and super soft foam. This combination of foams provides the sleeper with immediate pressure relief as well as some nice cooling. 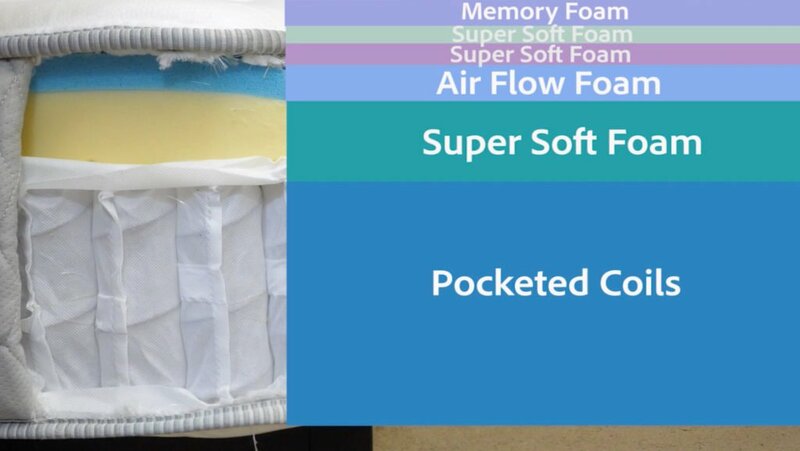 Comfort Layer – Beneath the plush cover, you’ll find an inch of Airflow Foam, which is similar to memory foam in that it has a slow response to pressure, producing both pleasant sinkage and contouring. However, unlike memory foam, this material is breathable and excellent at dispersing body heat. Transition Layer – Next up, we’ve got 2.5” of a soft polyfoam material. This section is firmer than the one above it, functioning as a transition between the soft layer up top and the pocketed coil system below. Here, you’ll start to really feel the buoyant support of the mattress. Support Layer – This layer is comprised of 7.5” of pocketed coils, which gives the bed most of its bounce and support. Given that these coils are individually wrapped, they’re also going to encourage airflow and excellent motion isolation. 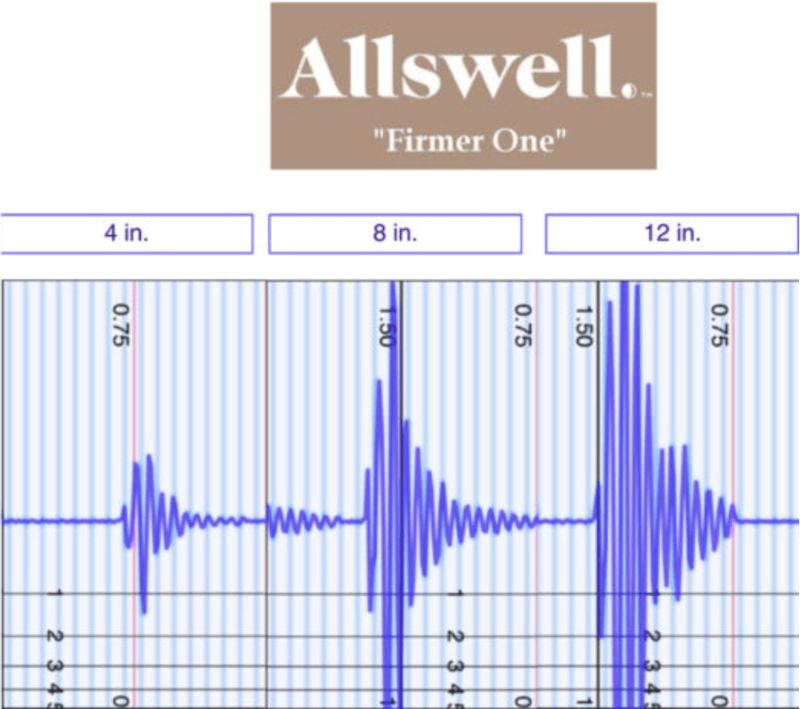 After taking a look at the constructions of these Allswell beds, let’s chat about their different firmness levels and feels. As I applied light force to the Allwell Luxe Hybrid, I found that I was immediately interacting with the soft foams quilted into the cover. My hand sank snuggly into this layer and I felt some quality pressure relief. Pushing in further, I began to experience the bounce of the mattress as I encountered both the polyfoam transition layer and the pocketed coil support system. 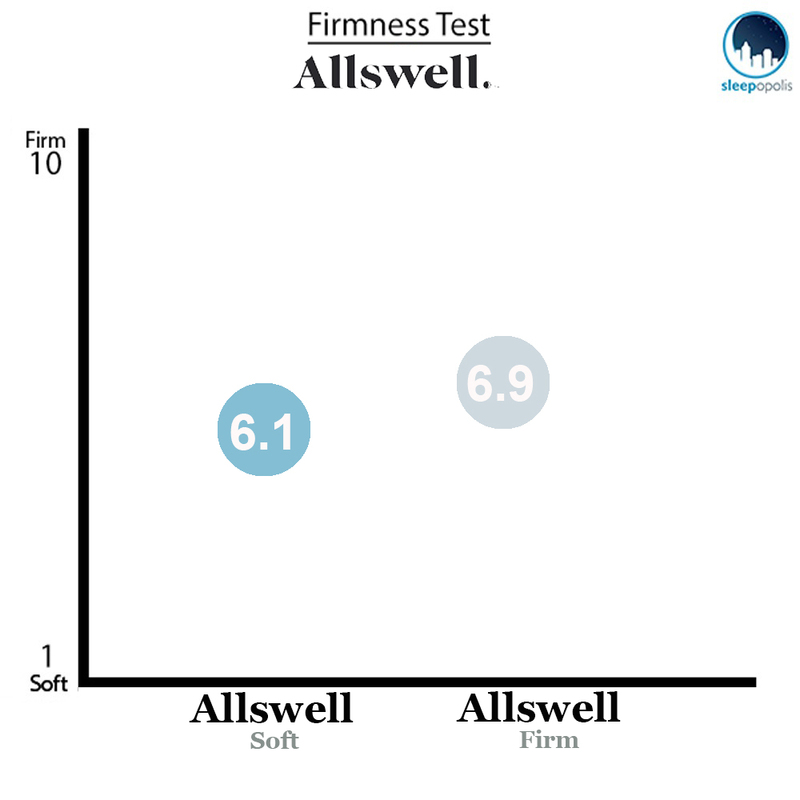 As you can see on the graph above, my testers gave the Allswell Luxe an average firmness rating of 6.9. When compared to the industry standard of 6.5 for medium firmness, it’s clear that this bed is just a touch above medium firm. I personally gave the bed a 6.5 as I found its pocketed coil system positioned me on top of the mattress and provided me with plenty of buoyant support. I should note that heavier sleepers may interact with this system differently as they’re likely to sink straight straight through to the coils and feel it as a firmer structure overall. Regardless, the soft foam layers will still produce nice body contouring for immediate pressure relief. Rather than just describing the feel of the Allswell Luxe Hybrid to you, I wanted to give a visual representation of where someone may feel pressure points form while lying on them. To do this, I placed a pressure map on top of each mattress and rested on my back, side, and stomach. You can see the results on the images below where pressure is represented from blue (low pressure) to red (high pressure). Back – Lying on my back, I felt some great relief from the bed. The foam layers up top worked to contour to the curves of my body and fill in the space at my lumbar region, which is great for back sleepers. While I did sink into the bed a bit, I never felt stuck in the mattress and was able to change positions easily. Side – Rolling onto my side, I felt the formation of pressure at my hips and shoulders, which you can see in the graphic above. Side sleepers tend to prefer a softer mattress as it will help to alleviate tension at these sensitive areas, so I’d recommend that strict side sleepers check out the softer version of the Allswell. 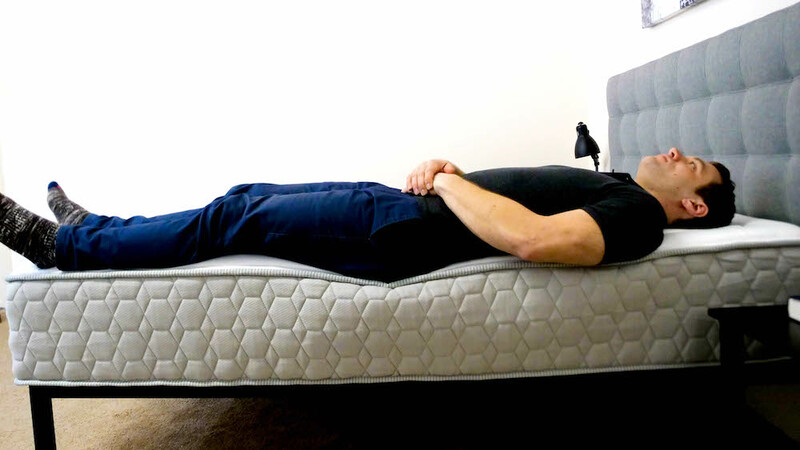 Stomach – A firmer mattress like this one is going to be especially great for stomach sleepers, as the strong support will keep their shoulders in line with their hips for an even spinal alignment. I didn’t experience too much pressure in this position, but would note that stomach sleepers who are a bit heavier than me (for reference, I’m 5’10”, 190 lbs.) may feel this differently. Next up, let’s talk a bit about motion transfer, or the amount of movement you’re likely to detect from one side of the bed to the other. This test will be especially important for those of you who plan on sharing your bed with a partner, as it’ll let you know if their midnight stumbles to the bathroom are going to disturb your sleep. In my opinion, these are high motion transfer results. While the individually wrapped coils do an alright job of isolating motion, the bounce of the firmer foams up top don’t really do much to dissipate the disturbance. 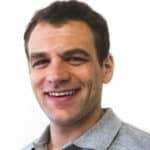 That being said, you are likely to feel your partner moving around at night, which is an important thing to keep in mind if you’re a particularly light sleeper. To visualize this sinkage, I placed four balls of varying sizes and densities (a 6 lb medicine ball, a 10 lb steel ball, a 50 lb medicine ball, and a 100 lb medicine ball) on the Allswell mattresses and measured how much they compressed the surface. I’m anticipating that the Allswell Home bed will have pretty different amounts of sinkage, but let’s run the test just to make sure. 50 lb medicine ball: 3.5 inches of sinkage. When comparing these rates of sinkage to other mattress reviews I’ve done, I can say these results are below average across the board. The pocketed coil system and the bouncy transition layer do a good job of lifting the sleeper up and out of the bed, so you’re not likely to feel stuck in the Allswell Hybrid. This is especially good news for stomach sleepers who, as I mentioned in the Pressure section, benefit most from this kind of firm support. And finally, edge support, which will matter to you If you’re going to share your bed with a partner and need to use the entire surface area of the mattress. Laying on my back near the edge of the Allswell FirmLying on my back near the side of the bed, I felt as secure as I did in the center. My weight was evenly distributed and the support layer did a fantastic job of keeping me on top of the bed. As I scooted closer to the edge, I noticed some slight compression through the top foam layers, but still felt solid. Rolling onto my side, I continued to feel well supported at the edge. You’ll notice some compression in the photograph above, but the pocketed coil system worked to lift me up and out of the structure so I never felt stuck or as if I’d roll out of bed. In this position, I wanted to simulate what it would feel like to be sitting on the bed in the morning when you’re lacing up your shoes and getting ready for the day. A lot of mattresses experience severe compression in this position, but the Allswell Hybrid actually held up super well. Shipping: Shipped directly to your door, compressed in a box. Costs include $25 ground shipping for all mattresses and $99 for white glove service. I should note that Allswell Home beds are not available to try in retail locations (such as Walmart) just yet, hence the 100 night trial period. If you’re convinced the Allswell is the right mattress for you, the size and pricing information for the beds are below. Please note that these prices reflect standard pricing. 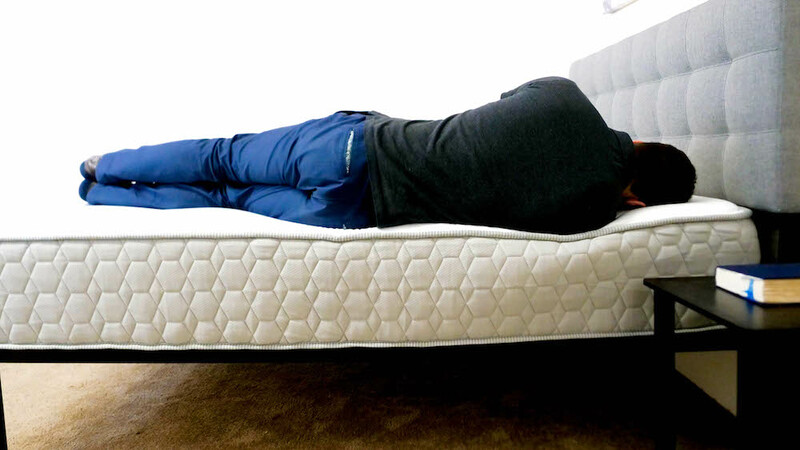 Stomach sleepers – As we discussed throughout the review, this is a firm mattress and would make a welcome addition to any stomach sleeper’s bedroom. The pocketed coil system will keep your hips lifted up and out of the bed resulting in a nice spinal alignment. Don’t want to feel stuck – If you’re a sleeper who doesn’t want to feel stuck in your bed, the Luxe Hybrid could be a great option for you. The transition layer coupled with the individually wrapped coils will leave you feeling like you’re sleeping “on top” of the mattress as opposed to “in” it. Heavier sleepers – For heavier sleepers in search of quality support, the Luxe Hybrid might be the mattress for you. It features a lot of bounce as well as some strong lift, so could be excellent for those sleepers who tend to feel stuck in other beds. 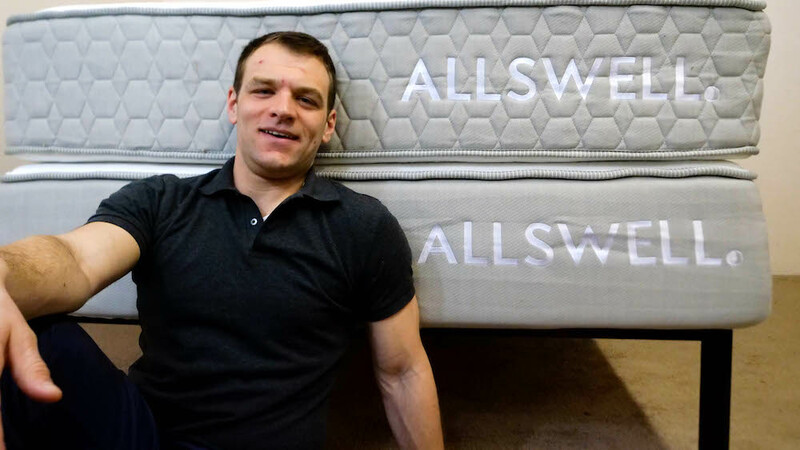 For more information on the Allswell mattress, check it out here! 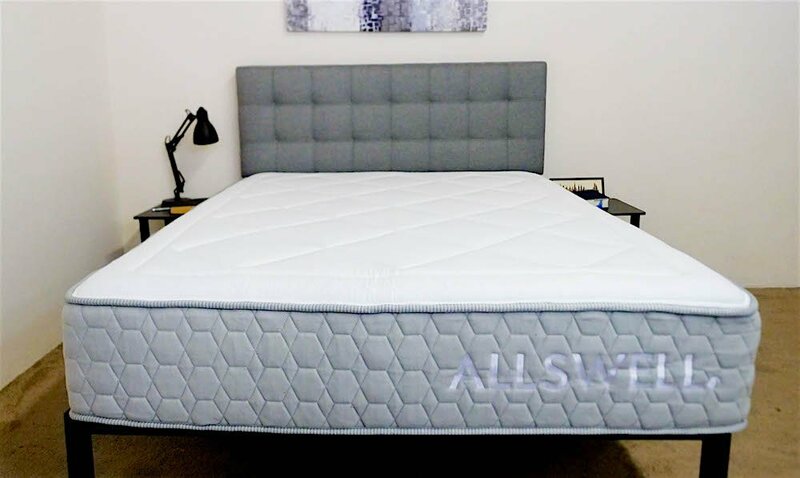 Allswell’s hybrid mattress featured a quilted cover with 3 inches of memory and super soft foam for immediate pressure relief. Even with this plush-feeling cover, I found this mattress to trend a bit toward the firmer side. The Allswell’s hybrid mattress also has good bounce, and I would recommend it for stomach sleepers.